THE STORY - A couple's relationship is tested when uninvited guests arrive at their home, disrupting their tranquil existence. From filmmaker Darren Aronofsky (Black Swan, Requiem for a Dream), mother! stars Jennifer Lawrence, Javier Bardem, Ed Harris and Michelle Pfeiffer in this riveting psychological thriller about love, devotion and sacrifice. THE GOOD - Aronofsky's best and most challenging piece of art yet. Stunning performances from Lawrence and Pfeiffer. THE BAD - This film is going to upset, confuse and alienate many. Some will simply not "get it." ​Close your eyes. Take a deep breath. Now, remember a time when you were laid up in your bed with the flu. Sweating while simultaneously freezing to death. Now combine that feeling with a time when your felt trapped in a crowded room. You can barely push your way to the open air and no matter where you turn you cannot be alone. Finally, combine that with a moment where you were faced with death. The sheer nervousness of no longer being able to breathe. Darren Aronofsky's "mother!" is a Petri dish for each of those feelings. Now if that sounds intense that doesn't even begin to describe it. "Mother!" is not only a brutal film but a thought provoking one as well. It forces you into this endless thought process of time, life and death. It brings you to the devastating realization that creation cannot exist without destruction. "Mother!" is a movie that will not satisfy certain viewers. It will, in fact, alienate some of them. There is so much chaos and ambiguity to shuffle through that it gets confusing at times. But once you have dug yourself through, fought tooth and nail to the center of this eccentric film, you will discover something brilliant. Something that is moving and simultaneously petrifying. The plot is difficult to describe but it can basically be shortened into one simple sentence; "A couple's relationship is tested when their peaceful existence becomes disturbed." Aronofsky's two main actors are Jennifer Lawrence and Javier Bardem. The two live peacefully in their mansion of a home out in the middle of nowhere when one day a man claiming to be a doctor, played by Ed Harris, arrives at their home. Harris only adds to the ambiguity that has already been set in place and we're only 20 minutes into the movie. Bardem offers Harris a night's stay at his home despite Jennifer Lawrence not agreeing with said offer. Harris then drags his own personal issues into the home of Bardem and Lawrence making the film all the more uncomfortable. Yet for some reason, Bardem is okay with all of this family drama. Harris' wife (Michelle Pfeiffer) ends up arriving at the house. Soon, their two sons arrive who are having some sort of argument over a will. Bardem is not unsettled in the slightest by the violent and outlandish actions that occur with Harris and Pfeiffer's family. As these acts continue to unfold, Jennifer Lawrence becomes more and more of a simple onlooker. She is caught in the middle of this anxiety filled mess. Phew, okay that was a lot. Bear with me I'm doing my best here. The situation just described was only the beginning. The confusion and terrifying aspects of this film stretch through its entire two-hour runtime. Not for a single frame does Aronofsky not try to unsettle you. "Mother!" is the kind of film that makes you nervous to blink because you don't want to miss a single thing. Each second is bleeding with emotion and fear that it is too difficult to look away. The visuals of "Mother!" are encapsulating. They're akin to a boiling black goo that seeps it's way off of the screen and forces itself into your veins. You understand that it's insane and disturbing but you somehow accept it. Almost the entire film is told in close ups and extreme close ups. There are so many moments where we move right into the eyes of the characters, literally. The film is mainly told from the point of view of Jennifer Lawrence's character (All of the characters are nameless). Not only do we experience and share her terror but we grow to love her. She has this glowing aura about her that is so homely and warm. Not only is the lighting motivated and crisp but each camera move is meant to add to the film's overall tension. Aronofsky does not provide us with tense moments or scenes because the entire thing is tense throughout. The camera is almost never static as we're constantly on the move. We get to soak in every small ounce of detail that Aronofsky and cinematographer Matthew Libatique have laid out for us. This does result in the film having a methodical pace but each moment is timed perfectly and it doesn't ever feel like it's moving too slow or too fast. It's moving at the exact pace it is meant to, in order to provide the most immersive and visceral experience possible. One thing that is worth mentioning, is just how brilliant the performances are. This may be a career best for each actor involved in the film (And that is saying a lot). Jennifer Lawrence is stunningly brilliant in her performance. She's known for delivering dialogue and radiating complex emotions for such a young actress but now with her performance in "Mother!" I would go so far as to say she has mastered utilizing her physicality in her acting method. Her eyes and body language tell an entire story in itself resulting in a performance that is an absolute stunner to stand alongside other great Aronofsky performances such as Ellen Burstyn ("Requiem For A Dream"), Mickey Rourke ("The Wrestler") and Natalie Portman ("Black Swan"). Javier Bardem and Ed Harris are both notable as well but the number two spot goes to Michelle Pfieffer. While Lawrence is busy showing up everyone in the industry with her face, Pfieffer is showing up everyone in the industry with her words. Pfieffer delivers every line of the script with this fierce and powerful tone. She is horrifying while also being calm and collected, making her another critical piece to this tricky Aronofsky puzzle. This story is dark and intense. The visuals are bleak and powerful. The editing is invigorating and focused. This is not only a return to form for Aronofsky after "Noah" but a mastery of the form. Everything that makes him a brilliant auteur is on display in this film. Aronofsky cranks all of his talents up to 11, swings for the fences and knocks it out of the park. This is the kind of film people will continue to debate for years to come. "Mother!" is a soul shaking, life changing viewing experience. It is the most ballsy film to come from a major studio of 2017. Notice I didn't say so far because nothing else this year is going to top this. 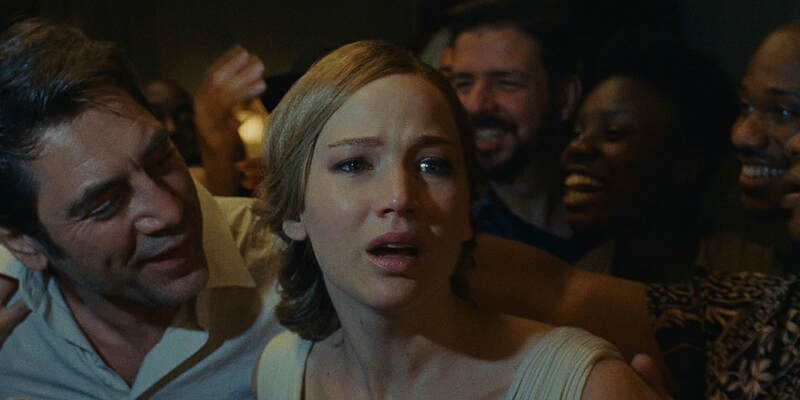 With career best performances from both Jennifer Lawrence and Michelle Pfieffer, and an artist working at the peak of his filmmaking powers, "Mother!" will leave you a blubbering, screaming, bloody mess as it hits you over the head with its dark message. If you have ever for a second doubted Aronofsky's work, see this film and hopefully you'll realize that he is one of our best filmmakers.